"Relief," "pride," "a sense of satisfaction"... these words were heard on the afternoon of 27 August as the last segment of the Tokamak Complex basemat (the B2 slab) was successfully poured. The finalization of the B2 slab (15 segments, 14,000 m³ of concrete, 3,600 tonnes of rebar) took eight months. Hundreds of people contributed to the different aspects of its realization, including design, procurement, scheduling, quality, finance and construction. Work began at 5:50 a.m. on the perfectly circular segment that will support the weight of the ITER Tokamak and ended 12 hours later at 6:00 p.m.
Late in the afternoon, some 100 people gathered in the Tokamak Pit—representatives of the ITER Organization; the European Domestic Agency, Fusion for Energy (F4E); F4E service contractors Engage (detailed design and work supervision), Energhia (management support) and Apave (health, safety and legal inspection services); and the F4E construction consortium led by GTM Sud from France—to celebrate the imminent completion of the works. ITER Director-General Osamu Motojima had the honour of putting the final, symbolic touch to the day's work. After smoothing the concrete surface with a trowel, he stopped to thank the workers for their hard work and dedication over the past months. He then turned to include the representatives of the organizations that had collaborated in the successful finalization of the B2 slab: "I congratulate all of you on this historic milestone—you have played an important role in the realization of ITER. The completion of concrete pouring on the B2 slab today represents a huge step forward." The B2 slab will support some 400,000 tonnes of building and equipment, including the 23,000-tonne ITER Tokamak. It's a "floating" foundation—installed on seismic columns, it has a capacity for lateral movement of up to 10 cm in any direction (a gap of approximately 1.5 metres separates the B2 slab from the surrounding retaining walls). 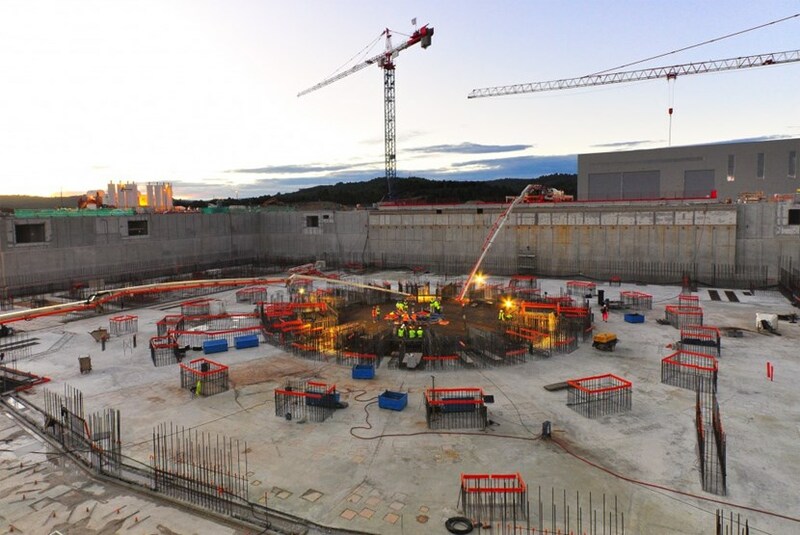 To pour the last 576 square metres of the Tokamak Complex basemat (the B2 slab), workers began manning two concrete pumps before dawn on 27 August 2014. The 1.5-metre-thick slab will serve as the first basement level of the Diagnostic, Tokamak and Tritium buildings. Five large drain tanks, supports for the base of the cryostat (the concrete crown), and the building walls will be positioned directly on it. "Today is a terrific day for the ITER Project," said Tim Watson, head of ITER's Buildings & Site Infrastructure Directorate. "The completion of the B2 slab was the last step in creating the ground support structure and anti-seismic foundations for the ITER Tokamak. Now, we can look forward to seeing the Tokamak Complex walls rise." Concrete pouring for the 9,300 m² B2 slab began in December 2013. It took three pours to realize the Diagnostic Building basemat at the south side of the Tokamak Pit, and another three to realize the Tritium Building foundation at the opposite end. Both were relatively straightforward compared to the central part of the basemat, where orthoradial (circular) and orthogonal (right-angled) rebar arrangements interface. 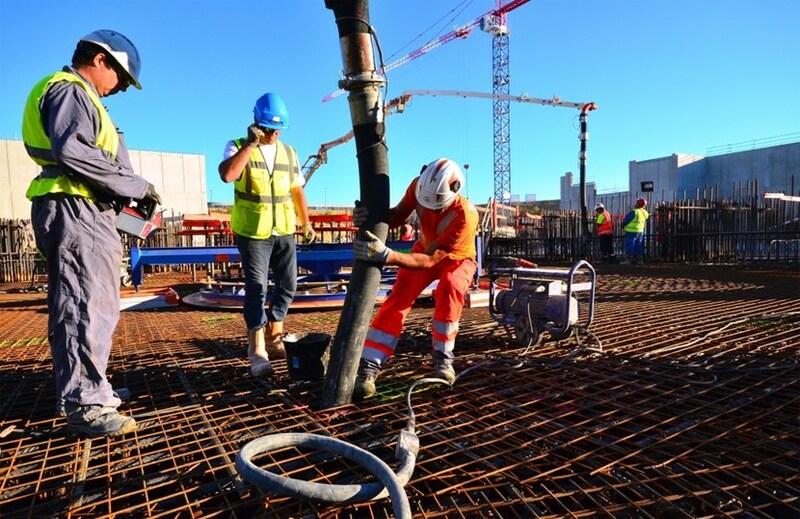 Following months of exchanges with the French Nuclear Safety Authority (ASN) and its technical experts at the Institute for Radioprotection and Nuclear Safety (IRSN), the hold point on this part of the slab was lifted and pouring operations were allowed to proceed. "Today's milestone demonstrates the project's capability to respect the required safety processes and advance systems integration, efforts which resulted in the release of the hold point by the ASN," emphasized Director-General Motojima. Miguel Curtido is F4E's technical responsible officer for the B2 slab: "Once we were given the green light, we began pouring the same day. We managed to keep a strong rhythm despite peaks in temperature and vacation schedules that made the pour days harder to schedule. We worked double shifts, on Saturday and—on three occasions—we poured concrete at night. The fact that we were able to realize nine segments in seven weeks is testimony to the incredible dedication of the entire team." "We kept to an ambitious schedule," adds Ben Slee, deputy head of Site, Buildings and Power Supplies at Fusion for Energy, "but at all times our first priority was quality and safety—these were not jeopardized at any moment. Today we have to thank not only those working on the construction site but also the hundreds of others who have been involved since the preparation and signature of the contract, within the different organizations, and who made this construction possible in terms of design, procurement, scheduling, quality, finance, etc." There now remain some procedural elements to conclude for the B2 slab (inspections, documentation); also, over the next few weeks GTM will be removing formwork and material from the worksite. "But today's milestone is key," says Miguel, "because it will allow the Tokamak Complex building consortium, VFR, to soon take possession of the entire B2 slab." The VFR consortium has already started to install formwork to frame out the lower walls of the Diagnostic Building. Next month, it will start to install five large cranes—including an 80-metre crane at the very centre of the Tokamak Pit—to transport building materials from storage areas at ground level to the B2 slab surface. 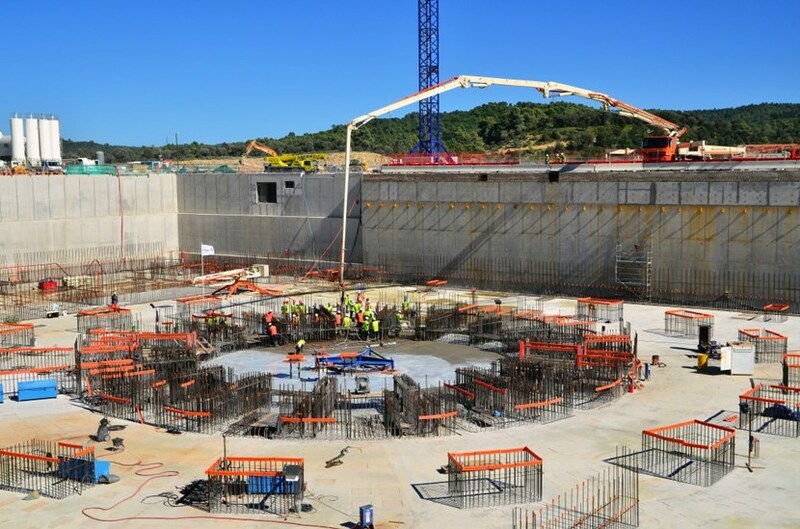 The next phase of ITER construction is beginning. The number of workers on site will rise significantly as work begins on the walls of the Tokamak Complex and the first 60-metre-tall pillars are set into place for the adjacent Assembly Building. Click here to view a selection of images of "the last pour." A three-minute video of the event can be viewed here.